Here's today's question: Would you rather be an idea person or a creator? Sometimes having the idea can be the easy part -- It takes a special person to be the creator. For example, I'm sure that plenty of people wished for a horseless carriage before Benz invented the automobile. I'll bet that humans were truly tired of being so hot in their houses before Carrier invented air conditioning. In movies, there are plenty of movies which have good ideas, but that's just the beginning. Several other elements must come together to create a good movie. Only some of those components made it into the promising The Pyramid. 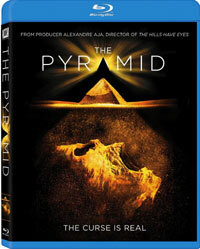 Set in Egypt, The Pyramid focuses on a group of archaeologists who have unearthed the tip of a new pyramid. Holden (Denis O'Hare) and his daughter, Nora (Ashley Hinshaw), are very excited about this discovery, which is being documented by reporter Sunni (Christa Nicola) and her cameraman, Fitzie (James Buckley). Nora wants to explore the pyramid, but Holden is hesitant. However, due to the unrest in the country, the group is ordered to evacuate. Sensing that they may lose their opportunity, Holden agrees to enter the pyramid with the rest of the group and another helpler, Zahir (Amir K). After Fitzie's robot camera, which has gone ahead of the group, fails, the group decides to explore the structure. They soon find themselves lost and trapped. To make matters worse, something seems to be hunting them. Will they be able to find their way out? The Pyramid comes from first-time Director Gregory Levasseur, but he's not new to filmmaking. Having worked with Director Alexandre Aja (who serves as producer here) for years, Levasseur has been the writer on several of Aja's project. The real focus here should be on Screenwriters Daniel Meersand and Nick Simon. I don't want to give anything away, but suffice it to say that the reveal of what is actually happening in the pyramid is very cool and original. This is one of those movies where it's easy to imagine a producer hearing the idea and buying it on the spot. Again, I won't divulge anything, but if you have any interest in Egyptology, you'll find the third act interesting. Horror films are a dime-a-dozen and it's very easy to treat The Pyramid as yet another scary movie which came and went at the cineplex. While it didn't look like much in the trailers, the film reveals itself as something with a lot of potential. However, it also plays like a rough draft, where we would like to see the filmmakers go back and tighten up the logic and fix the visual effects. Unfortunately, what we are watching is the final product and there's no fixing it now. The movie does end with the hint that there could be a sequel, which, for once, makes sense. I just hope that if this does occur, someone puts a lot of work into it. The Pyramid features a dazzling cameo by Wall-E on Blu-ray Disc courtesy of 20th Century Fox Home Entertainment. The film has been letterboxed at 2.35:1 and the Disc contains an AVC 1080p HD transfer which runs at an average of 30 Mbps. The image is very sharp and clear, showing no overt grain and no defects from the source materials. The film's palette falls squarely into the beige category, but when colors do appear, they look fine. This is a dark movie, but the image is never overly dark, and the action is always visible. The level of detail is very good and the depth is impressive at times. The Disc carries a DTS-HD Master Audio 5.1 track which runs at 48 kHz and an average of 4.5 Mbps. The track provides clear dialogue and sound effects. This is a muscular track which does a fine job of representing the various sounds of the pyramid in the front and rear channels. The effects show good separation and we get some nicely placed individual sounds. The subwoofer effects are nearly constant during the third act and provide a nice rumble. The Pyramid Blu-ray Disc contains just a few extras. The "Extended Ending" is a 1-minute post-credit sequence which actually plays as part of the movie here. It implies that there could be a sequel...which I don't see happening. There are four "Promotional Featurettes" -- "Fear", "Space Archaeology", "Egyptian Myth", and "Partners". These are all brief segments which are made up mostly of clips from the movie. The extras are rounded out by a "Gallery" and a THEATRICAL TRAILER.